We stand behind our service here at Kinsta and want you to be happy with your hosting. We are proud to offer a 30-day money-back guarantee and no long-term contracts. If you cancel your hosting account during the first 30 days of service we will issue a full refund. This means you can try out Kinsta risk-free for 30 days! This money-back guarantee covers the cost of any of our pre-built hosting plans, from Starter to Enterprise 4. In addition, if you opt to use any of our add-ons during this initial 30 day period and request a refund the cost of those add-ons will also be refunded. The guarantee is available to first-time customers. Returning customers are eligible for a partial refund of unused fees. This guarantee is available to you during the first 30 days after signing up for a brand new hosting plan. You can upgrade or downgrade your hosting plan during this time and the guarantee will still be in effect. However, the guarantee period runs for 30 days from the date that you initially sign up. The guarantee period does not start over each time you switch plans. Add-ons are only covered by this guarantee if you cancel your hosting account and all add-ons during the first 30 days of service. Add-ons are covered by our normal refund policy after the first 30 days of service. 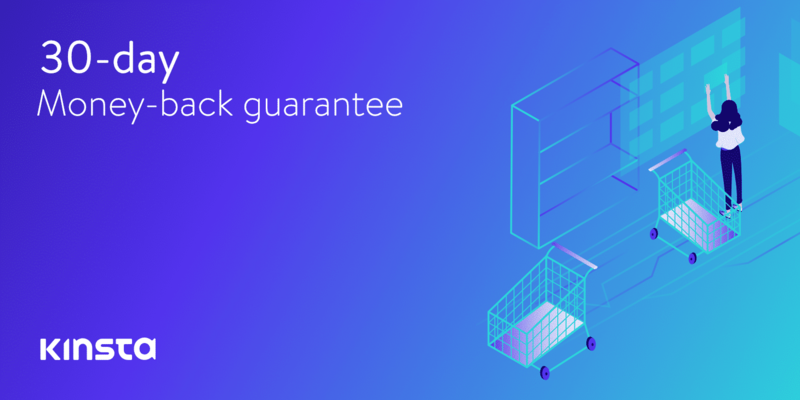 This guarantee applies to our standard hosting plans only. If you opt for a custom plan our normal refund policy applies. In some situations, you may be assessed a one-time fee. All one-time fees are non-refundable. Examples of one-time fees include paid migrations, a malware removal fee assessed when repairing a compromised site during a migration, or an infrastructure upgrade to handle a large-scale traffic event. If you incur any overage fees during the initial 30 day period the overage will be deducted from the refund. If the cost of the overage exceeds the value of the refund you will still be responsible for the additional amount of the overage not covered by the refund. If you cancel your subscription after the first 30 days we’ll refund the unused portion of your plan’s subscription. This includes both monthly and annual plans. Note: Calculations are based on the standard plans daily price (and not the 2 months off yearly price). You can cancel your plan from within your MyKinsta dashboard under the Billing section. Follow these instructions on how to cancel your plan. If you wish to cancel your Kinsta hosting account and request a full refund during your first 30 days with Kinsta or to request a partial refund at any point thereafter you can do this from your MyKinsta dashboard. Follow these instructions on how to cancel your plan. → What Happens if I Don’t Pay My Invoice? → How do I Update my Billing Address? → Billing Cycle – When do You Charge my Card?